We disapprove of school students attending shows, dances, dancing classes, theaters, engaging in school activities against their religious scruples, and wearing gymnasium clothes which immodestly expose the body. Divorce is permitted, after baptism & receiving the Holy Ghost when the "Unbeliever" in the marriage contract procures a divorce, the believer may remarry, but ONLY! to a Believer. (I-Cor 7:10-15). No believer may marry a Unbeliever. We believe in the One ever-living, eternal God; infinite in power, holy in nature, attributes and purpose, and possessing absolute, indivisible Deity. This one true God has revealed Himself as Father in creation, through the Son in redemption, and as the Holy Ghost by emanation (I Corinthians 8:6; Ephesians 4:6; II Corinthians 5:19; Joel 2:28). The Scripture does more than attempt to prove the existence of God; it asserts, assumes and declares that the knowledge of God is universal (Romans 1:19, 21, 28, 32; 2:15). God is invisible, incorporeal, without parts, without body and therefore free from all limitations. He is Spirit (John 4:24), and "a spirit hath not flesh and bones…" (Luke 24:39). The first of all commandments is, "Hear, O Israel: the LORD our God is one LORD:" (Mark 12:29; Deuteronomy 6:4). "One God and Father of all, who is above all, and through all, and in you all:" (Ephesians 4:6). This one True God manifested Himself in the Old Testament in divers ways, in the Son while He walked among men; as the Holy Ghost after the ascension. The one true God, the Jehovah of the Old Testament, took upon Himself the form of man, and as the Son of man, was born of the virgin Mary. As Paul says, "And without controversy great is the mystery of godliness: God was manifest in the flesh, justified in the Spirit, seen of angels, preached unto the Gentiles, believed on in the world, received up into glory" (I Timothy 3:16;John 1:10). "He came unto his own, and his own received him not." (John 1:11). This one true God was manifested in the flesh, that is, in His Son Jesus Christ. "… God was in Christ, reconciling the world unto himself, not imputing their trespasses unto them;…" (II Corinthians 5:19). We believe that, "… in Him (Jesus) dwelleth all the fullness of the Godhead bodily." (Colossians 2:9). "… unto us a child is born, unto us a son in given:… and his name shall be called Wonderful, Counselor, The mighty God, The everlasting Father, The Prince of Peace" (Isaiah 9:6). This prophecy of Isaiah was fulfilled when the Son of God was named, "And she shall bring forth a son, and thou shalt call his name JESUS: For he shall save his people from their sins" (Matthew 1:21). "Neither is there salvation in any other: for there is none other name under heaven given among men, whereby we must be saved" (Acts 4:12). The Name Of JESUS! God created man in His own image (Genesis 1:26,27), innocent, pure and holy (Romans 5:11, Ephesians 2:3). Man needed a redeemer which has been supplied in the seed of the woman, which seed bruised the serpent's head (Genesis 3:15; Luke 2:10,11); that is, Our Lord and Savior Jesus Christ in whom we have redemption through His blood, even the forgiveness of sins (Ephesians 1:7; Revelation 1:5). "For by grace are ye saved through faith; and that not of yourselves: it is the gift of God:" (Ephesians 2:8). Melchizedek, the priest of the Most High God, gave the first communion, consisting of bread and wine (Genesis 14:18), to our father Abraham. Christ, being "made a high priest for ever after the order of Melchizedek." Evidently administered the same (Hebrews 7:21; Matthew 26:26-29; I Corinthians 11:23-32). On the night of our Lord's betrayal, He ate the Passover supper with His apostles, after which He instituted the Communion service. "And he took bread, and gave thanks, and brake it, and gave unto them saying, This is my body which is given for you: this do in remembrance of me. Likewise also the cup after supper, saying, This cup is the New Testament in my blood, which is shed for you" (Luke 22:19, 20). Paul instructed the Church how to observe it (I Corinthians 11:23, 24,25). This ordinance is as much a divine command as any other New Testament ordinance. Jesus gave us an example that we do even as He had done. He said that we ought to wash one another's feet. And again, "If ye know these things, happy are ye if you do them" (John 13:4-17). There is scriptural evidence that this was practiced by the church in the days of the apostle Paul (I Timothy 5:10). We see from this that healing for the body is in the atonement. That being true, then it is for all who believe. Jesus said of the believer, "… they shall lay hands on the sick, and they shall recover." Later James wrote in his epistle to all the church, "Is any sick among you? Let him call for the elders of the church; and let them pray over him, anointing him with oil in the name of the Lord: And the prayer of faith shall save the sick, and the Lord shall raise him up; and if he have committed sins, they shall be forgiven him. Confess your faults one to another, and pray one for another, that ye may be healed. The effectual fervent prayer of a righteous man avails much" (James 5:14-16). The only grounds upon which God will accept a sinner is Repentance from the heart for his sins that he has committed. A broken and contrite heart He will not despise (Psalm 51:17). John preached repentance, Jesus proclaimed it, and before His ascension commanded that repentance and remission of sins should be preached In His name, beginning at Jerusalem (Luke 24:47). Peter fulfilled this command on the day of Pentecost (Acts 2:38). The scriptural mode of baptism is Immersion, and is only for those who have fully repented, having turned from their sins and a love of the world. It should be administered by a duly authorized minister of the Gospel in obedience to the Word of God and in the name of Jesus Christ, according to the Acts of the Apostles; 2:38; 8:16; 10:48; 19:5, thus obeying and fulfilling Matthew 28:19. John the Baptist, in Matthew 3:11, said "… He shall baptize you with the Holy Ghost." Jesus, in Acts 1:5, said, "… ye shall be baptized with the Holy Ghost not many days hence." Luke tells us in Acts 2:4, "… and they were all filled with the Holy Ghost and began to speak with other tongues, (languages) as the Spirit gave them utterance." The terms "baptized with the Holy Ghost," "filled with the Holy Ghost," and the "gift of the Holy Ghost," are synonymous terms which are interchangeable in the Bible. The basic and fundamental doctrine of this Organization shall be the Bible standard of full salvation, which is repentance, baptism in water by immersion in the name of Jesus Christ for the remission of sins, and the baptism of the Holy Ghost with the evidence of speaking with other tongues as the Spirit gives the utterance (Acts 2:4,38; John 3:5). We believe that godly living should characterize the life and walk of all saints according to the sign and example found in I Peter 2:21; Titus 2:11; Galatians 2:20; Hebrews 12:14; I Peter 1:15-17. We believe we are to cleanse ourselves from all filthiness of the flesh and spirit, perfecting holiness in the fear of God (II Corinthians 7:1), to abstain from all appearance of evil (I Thessalonians 5:22), and to turn away from those who have a form of godliness but deny the power thereof (II Timothy 3:5; I Corinthians 11:6; I Timothy 2:9,10; I Peter 2:3,4). The Apostle Peter gives instruction to wives about their behavior and their appearance, "Likewise, ye wives, be in subjection to your own husbands; that, if any obey not the word, they also may without the word be won by the conversation of the wives; while they be-hold your chaste conversation coupled with fear. Whose adorning let it not be that outward adorning of plaiting the hair, and of wearing of gold, or of putting on of apparel; but let it be the hidden man of the heart, in that which is not corruptible, even the ornament of a meek and quiet spirit, which is in the sight of God of great price" (I Peter 3:1-4). The Word of God teaches a distinction between the dress of a woman and a man: "The woman shall not wear that which pertains unto a man, neither shall a man put on a woman's garments: for all that do so are abomination unto the LORD thy God." (Deuteronomy 22:5) The word "abomination" used by God in this verse indicates that this rule will not change through all generations. Christian men are not to wear women's clothing, and Christian women are not to wear men's clothing. Modesty is not confined to dress alone but also includes conversation and manners. Philippians 4:5 teaches us, "Let your moderation be known unto all men. The Lord is at hand." Holiness is not only an inward presence of God but it is also reflected in the outward life of the Christian in his conduct in this world. "Whosoever shall put away his wife, except it be for fornication, and shall marry another, committeth adultery" (Matthew 5:32; 19:9). In order to lift a higher standard in the ministry, no minister shall be accepted in this organization who has married for the second time after his conversion, unless the first marriage was terminated by a death or Fornication as Stated above. The people of God shall have no connection whatsoever with religious oriented secret societies or any other organization (labor unions excluded) wherein bound by an oath to unbelievers. That the Lord Jesus Christ is to come to earth in person is a doctrine clearly set forth in Apostolic times. James taught it; the Apostles preached it; the saints expect it; (See Matthew 24:1, etc. 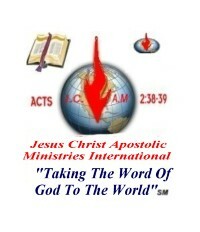 ; Acts 1:11; 3:19-21; I Corinthians 1:7,8; 11:26; Philippians 3:20,21; Titus 2:13). We believe the catching away of the church is drawing nigh, and at that time all the dead in Christ shall rise from their graves, and we that are alive and remain shall be translated or "caught up" to meet the Lord in the air (Matthew 24:36-42; Luke 17:20-37; I Corinthians 15:51; Philippians 3:20,21; I Thessalonians 4:13-17). Whereas, the Word of God teaches the imminent second coming of our Lord Jesus Christ and that there will be first an appearing or catching away of the Church (I Thessalonians 4:13) preceding His second coming back to earth; and said first appearance we believe to be at hand and likely to occur at any moment. Moreover, we believe that the distress upon the earth is the "beginning of sorrows" and will become more intense until there "shall be a time of trouble such as never was since there was a nation even to that same time," (Matthew 24:21; Daniel 12:1; Romans 11:25-27). We believe that the period of "Tribulation" will be followed by the dawn of a better day on earth, and that for one thousand years there shall be "peace on earth and good will toward men," (Revelation 20:1-5; Isaiah 65:17-25; Matthew 5:5; Daniel 7:27; Micah 4:1; Habakkuk 2:14; Romans 11:25-27). When the thousand years are finished, there shall be a resurrection of the dead who shall be summoned before the Great White Throne for their final judgment, and all whose names are not found written in the Book of Life shall be cast into the lake of fire, burning with the brimstone, which God has prepared for the devil and his angels (Revelation 20:5-15; Matthew 24:41-46; Revelation 21:8). All civil magistrates are ordained of God for peace, safety, and the welfare of all people (Romans 13:1-10; Titus 3:1,2; I Peter 2:13,14); therefore, it is our duty to be in obedience to all requirements of the law that are not contrary to the Word of God and that do not force one to the violation of the sixth commandment by bearing arms. It is our duty to honor without murmuring (Matthew 17:24-27; 22:17-21) and show respect to them in all lawful requirements of the civil government. We propose to fulfill all the obligations of loyal citizens, but are constrained to declare against participation in combatant service in war, armed insurrection, property destruction, aiding and abetting in or the actual destruction of human life. Furthermore, we cannot conscientiously affiliate with any union boycott or organization which will force or bind any of its members to perform any duties contrary to our conscience or receive any mark without our right to affirm or reject same. However, we regret the false impression created by some groups or so-called "Conscientious Objectors" that to obey the Bible is to have contempt for law or magistrates, to be disloyal to our government and in sympathy with our enemies, or to be unwilling to sacrifice for the preservation of our commonwealth. This attitude would be as contemptible to us as to any patriot. The Word of God commands us to do violence to no man. It also commands us that first of all we are to pray for rulers of our country. We, therefore, exhort our members to freely and willingly respond to the call of our Government except in the matter of bearing arms. When we say service - we mean service - no matter how hard . First of all, let us earnestly pray that we will with honor be kept out of war. We believe that we can be consistent in service to our Government in certain non-combatant capacities, but not in the bearing of arms.